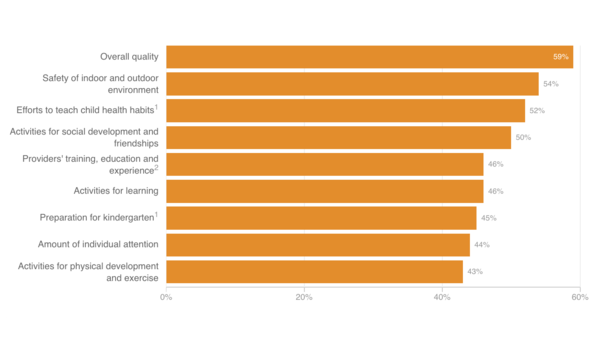 Parents' views of child care are a little like life in Lake Wobegon — the vast majority say it's way above average. That's just one of the findings in a poll looking at child care and health from NPR, the Robert Wood Johnson Foundation and the Harvard T.H. Chan School of Public Health, released Monday. In it, we found that a remarkable 88 percent rated their child care as "very good" or "excellent." That stands in stark contrast to the most comprehensive and most recent study on child care and child development, which rated the quality of fewer than 10 percent of child care arrangements in the U.S. as "very high." The vast majority of child care was rated as only "fair." That 15-year-long study by the National Institutes of Health looked at a wide range of quality measures, from basic safety to daily activities and interactions with providers and other children. That led us to think about how there could be such a big disconnect between parents' perceptions and apparent reality. It may be that parents' measures of quality are very different from those who study childhood development. Or parents may be reluctant to tell a pollster that they've got their child in anything other than the best child care. "Our findings suggest that parents value and seek out quality child care and believe it benefits their child and themselves," says Gillian SteelFisher, research scientist and deputy director of the Harvard Opinion Research Program and the poll's academic leader. "However, we also found that parents face challenges related to the limited options they have for child care, the cost, and a lack of information about its quality." To get a reading on the state of child care and health in America today, we looked for parents of children up to age 5 who were not yet in kindergarten and whose child receives regularly scheduled care at least once a week from someone other than a parent. We conducted interviews in English or Spanish and on landlines and cellphones. The margin of error is plus or minus 3.4 percentage points. 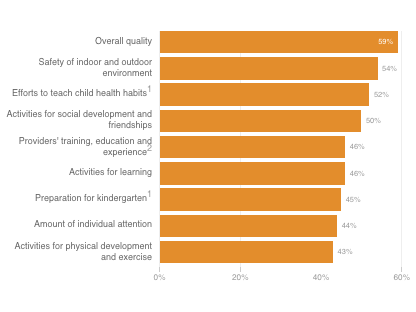 When it comes to the individual features of the care their child receives, safety of the indoor and outdoor environment was most frequently rated as excellent, followed closely by other measures. But just finding child care can be a major challenge, with 1 in 5 parents saying there was only one "realistic" child care option for his or her child. It will come as no surprise, but cost was the most common challenge in finding child care, with 27 percent of people saying it's an issue. Four in 10 parents (39 percent) say that the cost of paid child care in their area is not affordable for them. In addition to asking parents about quality and cost in our poll, we wanted to find out how they perceive the impact that child care has on their child and themselves — and whether child care has lasting effects. The most surprising finding was that parents, particularly mothers, feel child care has benefited their own health and well-being, as well as their relationship with the child. Half the mothers said it had a "very positive effect" on their relationship with their spouse and an even larger percentage, 64 percent, saw a very positive effect on their relationship with their child. We also wanted to find out what happens when a child is sick and can't go to child care. The results: Mothers are more likely to stay home than fathers. And our results suggest that traditional views of gender roles may foster this dynamic. When parents said mothers are most likely to stay home, 16 percent said it was because it was their responsibility to take care of the child, while just 4 percent of parents viewed it as the father's responsibility. One of the strongest findings in the poll was that 86 percent feel that care in early childhood has a "major impact" on a child's long-term well-being. While it is perhaps not terribly surprising that 84 percent said there was a major impact on kindergarten readiness, it's worth noting that 52 percent said there was a major impact on job success later in life. Hillary Clinton has proposed universal access to preschool for 4-year-olds within 10 years, and she would seek to double funding for the Early Head Start and Early Head Start-Child Care Partnership programs as well as increasing funding for child development and support programs for children under age 3 and pregnant women. She is also calling for 12 weeks of paid family and medical leave for both parents. And she has proposed capping the amount a family spends on child care at 10 percent of income, among several other actions aimed at reducing costs. Donald Trump has proposed allowing all parents to deduct the average cost of child care in their state from their income taxes, limiting it to those who make under $250,000 as a single parent or $500,000 for a couple. He would also allow tax-free contributions of up to $2,000 a year to dependent care savings accounts, with a 50 percent federal government match for low-income parents, up to $1,000. Trump also has proposed a paid maternity leave program. Libertarian candidate Gary Johnston has not proposed anything specific on child care, while the Green Party's Jill Stein has called for universal child care. Detailed fact checks of the Clinton and Trump positions are here and here. There's a lot more in the full poll report, but one final note: Parents perceive significant differences in quality depending on where they get care — from a relative versus a nonrelative versus a center. NPR will provide in-depth reporting on the results of this poll in a series of radio and online reports over the coming weeks, including a story on Morning Edition Tuesday that explores the giant disconnect between parents and experts when it comes to quality. We'll also live stream an expert panel at Harvard discussing these issues, Tuesday at 12:30 p.m. ET on NPR.org.